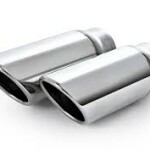 Best Exhaust Repair & Replacement Service; Exhaust Manifold, Flex Pipe, Catalytic Converter, Oxygen Sensors, Resonator and Muffler Repair in MA, IR, Attleboro, Mansfield, North Attleboro, Plainville, Cumberland, Pawtucket. 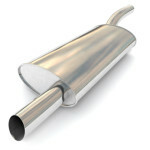 An exhaust system is a critical part of a car, it is made of several pipes that are designed to connect to each other. The exhaust pipes and components are used to guide and clean burnt gases made by the combustion reaction away from the engine. 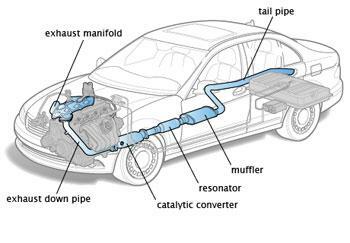 A typical car exhaust consists of and exhaust manifold, down pipe, flex pipe, catalytic converter, O2 sensor, resonator, muffler and a tail pipe. At the top of the exhaust system there is the exhaust manifold. The exhaust manifold collects burned exhaust gases from multiple cylinders in the engine into one pipe. 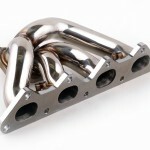 Depending on the engine and type of vehicle, the manifold is either a cast iron manifold assembly or a set of pipes. Over time, the constant expansion and contraction of the manifold caused by heating and cooling can cause cracks or leaks. A leaky exhaust manifold is loud, releases hot exhaust gases and can impact engine performance. The Exhaust down down pipe connects the exhaust manifold to the catalytic converter. For most cars, the down pipe is incorporated with the catalytic converter. A flex pipe is a flexible piece of pipe that allows the exhaust system flexibility. 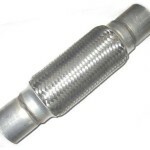 Flex pipes are an essential part of the exhaust system on front and all wheel drive vehicle, when a car accelerate the motor rocks and the flex pipe flexes, protecting the exhaust system from cracking. A catalytic converter is used to reduce air pollution created by the combustion engine. It is an emissions control device that is part of the exhaust system that converts toxic pollutants by up to 90 percent to less toxic gases. 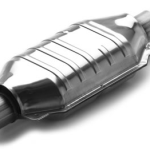 The catalytic converter uses a catalyst in the form of platinum and palladium coated by a ceramic honeycomb or ceramic beads to create a chemical reaction converting Hydrocarbons, Carbon Monoxide and Nitrogen Oxides into Carbon Dioxide, Nitrogen, Oxygen and water. 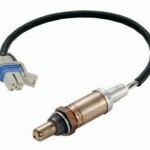 An oxygen sensor is part of the emissions control system placed on the exhaust that feeds data to the computer to help the engine run efficiently and reduce emissions. Cars have a minimum of two O2 sensors that measure the amount of oxygen in the exhaust system to ensure that proper air to gas ratio. The upstream oxygen sensor usually located on the exhaust manifold measures how rich or lean exhaust gases are they exit the combustion chamber. The downstream oxygen sensors located behind the catalytic converter measure the oxygen content of the exhaust gases leaving the catalytic converter. The resonator is an acoustic device made of a hollow steel cylinder tube in an exhaust system that tunes the sound of the engine to something less brutal to the ear by canceling out a certain sound frequencies. Resonators do not quiet the exhaust, they only eliminate certain frequencies that sound harsh. In sports and performance exhausts, a resonator can make the exhaust note louder and more aggressive. The muffler decreases the noise in an exhaust created by the combustion process inside of the engine. 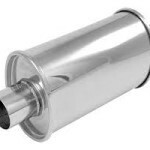 Mufflers use a series of perforated tubes or baffled chambers designed to dissipate the energy and quiet the noise. Noise comes into the muffler, the sound waves bounce against the baffles, creating opposite sound waves that cancel each other out. Some mufflers also use fiberglass insulation that absorbs the sound energy as the exhaust gases flow through. 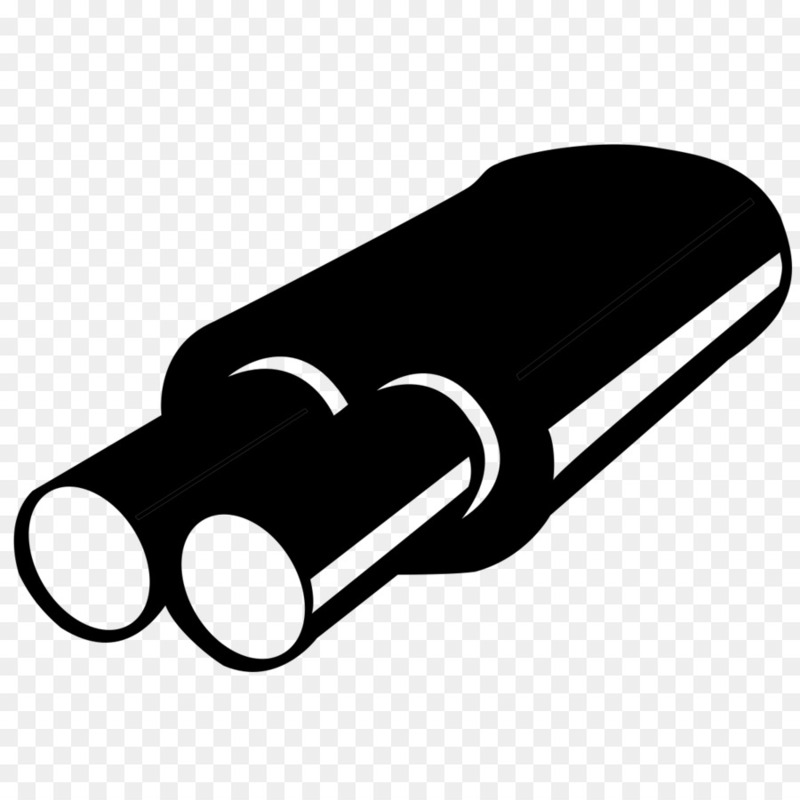 A side effect of mufflers is an increase of back pressure which decreases engine efficiency. The tailpipe also know as the exhaust pipe is the rear section of the exhaust system of a motor vehicle. It is the end of the exhaust usually made of steel, stainless steel or aluminum tubing by which the gasses are discharged. In a dual exhaust system Y pipes are used with balance pipes to equalize the exhaust pulses. Intermediate pipes are used to connect the main components of the exhaust system. Whether you’re looking to repair or replace an exhaust system or a part of an exhaust system, Advanced Auto Repair offers quality exhaust repair in North Attleborough MA. Full exhaust repair including exhaust manifold replacement, flex pipe replacement, catalytic converter replacement, oxygen sensor replacement, resonator repair and replacement, muffler repair and replacement, and tail pipe replacement. Our professional technicians can diagnose your cars exhaust leaks, noise and issue, and perform repairs, quickly and efficiently for a nice smooth ride at competitive affordable prices. Advanced Auto Repair serving Massachusetts, Rode Island, Attleboro, North Attleboro, Plainville, Wrentham, Foxborouh, Mansfield, Norton, Cumberland and Pawtucket.